If you’re looking looking to switch up your fitness routine, high-intensity interval training might be a new technique you want to try during your next gym session. 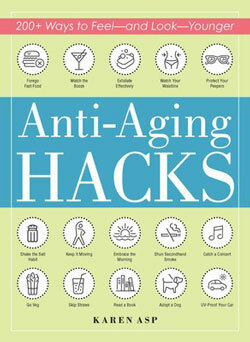 Karen Asp, author of ANTI-AGING HACKS, shares the secrets to this type of training. Exercise is a cornerstone of graceful aging. If you’re pressed for time, try high-intensity interval training (HIIT). HIIT simply means alternating between periods of very hard work and periods of rest. With this type of exercise, you’ll improve cardiovascular fitness, lower your blood sugar, and can even reverse signs of aging at the cellular level, preventing the loss of mitochondrial activity which typically declines with age and is associated with greater fatigue and a reduction in your muscles’ ability to burn any excess blood sugar. Yet the real magic lies in the fat loss. Studies show that HIIT may be even more effective than traditional cardio in helping you shed fat, both the kind that you can pinch (subcutaneous) and toxic abdominal fat that surrounds your organs (visceral). Perhaps the best thing about HIIT is that you need only ten to twenty minutes to do it, making it the perfect workout if you’re short on time. There are many ways you can structure a HIIT workout. If you’re fairly fit, try sprinting for thirty seconds in whatever activity you’re doing, recovering for four minutes, and repeating again four to six times. If you need a less intense session, climb a hill during that thirty-second burst and then recover. Or, play with whatever work-to-rest ratio works for you, whether that’s thirty seconds of hard activity followed by one minute of easy, one minute hard followed by one minute easy, or one minute hard followed by two minutes easy. If you have any joint issues, using a stationary bike is often easier than running or walking when doing HIIT. Because of its intense nature, do HIIT no more than one or two times a week, and, of course, check with your healthcare provider before adding it to your program. 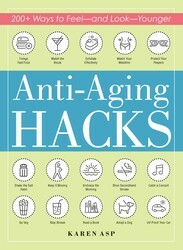 Get more tips to improve your health and fitness in ANTI-AGING HACKS by Karen Asp! Photo by Aquachara.com on Unsplash.